Related by Rabbi Joseph B. Soloveichik in a lecture at the Lincoln Square Synagogue, New York, May 28, 1975. I recall an experience from my early youth. Let me give you the background of that experience. I was then about seven or eight years old. I attended a cheder in a small town on the border of White Russia and Russia proper. The town was called Khaslavichy; you certainly have never heard of it. My father was the rabbi in the town. I, like every other Jewish boy, attended the cheder. 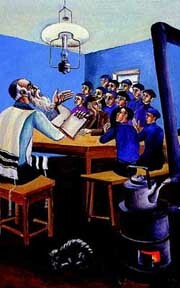 My teacher was not a great scholar but he was a Chassid, a Chabadnik. The episode I am about to relate to you took place on a murky winter day in January. I still remember the day; it was cloudy and overcast. It was just after the Chanukah festival, and the Torah portion of the week was Vayigash (Genesis 44:18-47:27). With the end of Hanukah ended the little bit of serenity and yomtovkeit (holiday spirit) that the festival brought into the monotonous life of the town's Jews. As far as the boys from the cheder were concerned, a long desolate winter lay ahead. It was a period in which we had to get up while it was still dark and return home from the cheder with a lantern in the hand of each boy, because nightfall was so early. On that particular day, the whole cheder, all the boys, were in a depressed mood — listless, lazy, and sad. We recited, or I should say chanted mechanically, the first verses of Vayigash in a dull monotone. We were simply droning the words in Hebrew and in Yiddish. So we kept on reading mechanically: Then Judah approached him [Joseph].... My lord has asked his servants, saying: "Have you a father, or a brother?" And we said to my lord: "We have an old father, and a young child of his old age..." Permit me to use the interpretation of the Targum Yerushalmi of the words yeled zekunim ("a young child of his old age"), namely a talented boy, a capable, talented, bright child. "We have an old father, and we also have a talented little child." The boy, reading mechanically, finished reciting the question: Ha-yesh lachem av? Do you have a father? and the reply: Yesh lanu av zaken ve-yeled zekunim katan, We have an old father, and a young child of his old age. Then something strange happened. The melamed (teacher), who was half-asleep while the boy was droning on the words in Hebrew and Yiddish, rose, jumped to his feet and with a strange, enigmatic gleam in his eyes, motioned to the reader to stop. Then the melamed turned to me and addressed me with the Russian word meaning "assistant to the rabbi," podrabin. Whenever he was excited he used to address me with this title, "assistant to the rabbi." There was a tinge of sarcasm and cynicism in his using the term, because this Chabad chassid could never forgive me for having been born into the house of Brisk which represented the elite of the opposition to Chassidism. Although I must say that I cannot accept responsibility for this fact because it was an accident of birth. Then he said to me: "What kind of question did Joseph ask his brothers, Ha-yesh lachem av? Do you have a father? Of course they had a father, everybody has a father! The only person who had no father was the first man of creation, Adam. But anyone who is born into this world has a father. What kind of a question was it?" I began, "Joseph . . ." I tried to answer, but he did not let me. Joseph, I finally said, meant to find out whether the father was still alive. "Do you still have a father," meaning, is he alive, not dead? If so, the melamed thundered back at me, he should have phrased the question differently: "Is your father still alive?" To argue with the melamed was useless. He began to speak. He was no longer addressing the boys. The impression he gave was that he was speaking to some mysterious visitor, a guest who had come into the cheder, into that cold room. And he kept on talking. Joseph did not intend to ask his brothers about avot d'isgalyim. I later discovered that this was a Chabad term for parenthood which is open, visible. He was asking them about avot d'iscasin, about the mysterious parenthood, the hidden and invisible parenthood. In modern idiom, I would say he meant to express the idea that Joseph was inquiring about existential parenthood, not biological parenthood. Joseph, the melamed concluded, was anxious to know whether they felt themselves committed to their roots, to their origins. Were they origin conscious? Are you, Joseph asked the brothers, rooted in your father? Do you look upon him the way the branches, or the blossoms, look upon the roots of the tree? Do you look upon your father as the feeder, as the foundation of your existence? Do you look upon him as the provider and sustainer of your existence? Or are you a band of rootless shepherds who forget their origin, and travel and wander from place to place, from pasture to pasture? Suddenly, he stopped addressing the strange visitor and began to talk to us. Raising his voice, he asked: "Are you modest and humble? Do you admit that the old father represents an old tradition? "Do you believe that the father is capable of telling you something new, something exciting? Something challenging? Something you did not know before? Or are you insolent, arrogant, and vain, and deny your dependence upon your father, upon your source?" "Ha-yesh lachem av?! Do you have a father?!" exclaimed the melamed, pointing at my study-mate. I had a study-mate who was considered a child prodigy in the town. He was the prodigy and I had the reputation of being slow. His name was Isaac. The melamed turned to him and said: "Who knows more? Do you know more because you are well versed in the Talmud, or does your father, Jacob the blacksmith, know more even though he can barely read Hebrew? Are you proud of your father? If a Jew admits to the supremacy of his father, then, ipso facto, he admits to the supremacy of the Universal Father, the ancient Creator of the world who is called Atik Yomim ('He of Ancient Days')." That is the experience I had with the melamed. I have never forgotten it. An important Reminder This story is especially poignant for the Ba'al Teshuva who likely knows more of Torah and Judaism than his/her parents. Still, they are our parents, our source, and we must respect them, treasure and honor them. Same for those who were fortunate enough to attend college while thier parents had to work from a young age. Ha-yesh lachem av?! "Do you believe that the father is capable of telling you something new, something exciting? Something challenging? Something you did not know before? Or are you insolent, arrogant, and vain, and deny your dependence upon your father, upon your source?" You - are always connected to Heaven. To acknowledge the Atik Yomim ('He of Ancient Days')." the All Father, your seeking is complete, and you know rest. Do You Have a Father? Thank you very much! The name of the father has to be recalled, recorded, each day! There was a tinge of sarcasm and cynicism in his using the term, because this Chabad chassid could never forgive me for having been born into the house of Brisk which represented the elite of the opposition to Chassidism. Although I must say that I cannot accept responsibility for this fact because it was an accident of birth.